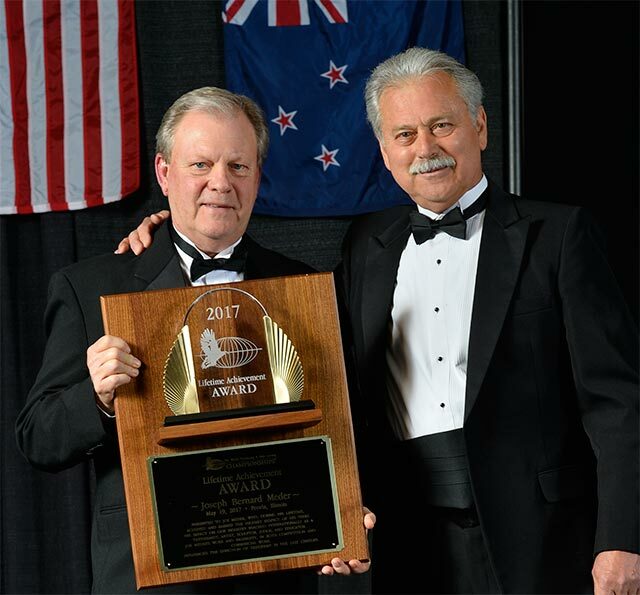 On May 19, 2017, at the World Taxidermy and Fish Carving Championships® awards banquet held at the Peoria, Illinois Civic Center, Show Chairman Larry Blomquist and Master of Ceremonies Russell Knight presented the fifth ever World Show Lifetime Achievement Award to Joe Meder of Solon, Iowa. Honoree Joe Meder of Iowa (left) with Master of Ceremonies Russell Knight of Alaska (right). 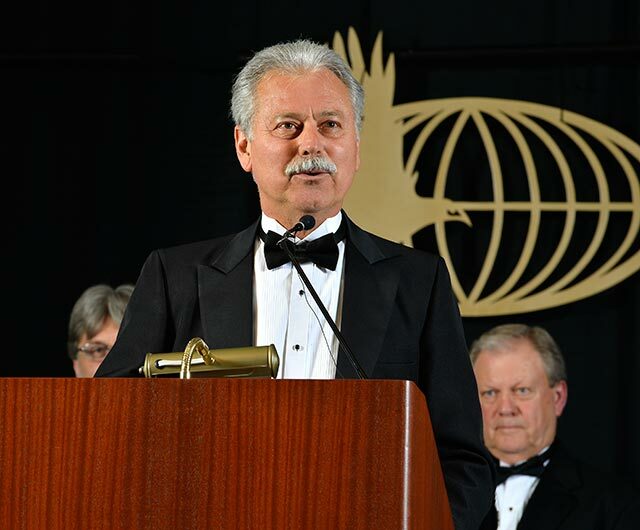 Joe’s influence on the modern taxidermy industry, including his excellence as an educator, innovator and industry leader, have propelled him to the epitome of his profession, sharing this unique award with the late Henry Wichers Inchumuk in 2007, the late Simon T. Blackshaw in 2011, Bob Berry of California in 2013, and Joe Kish of Texas in 2015. Below is the full script written for the video presentation, which was edited down to the final shorter version for time constraints. World Show Chairman Larry Blomquist (left) with honoree Joe Meder of Iowa (right). Joseph Bernard Meder was born in Guttenberg, Iowa, on November 1, 1949. Guttenberg is a small community on the Mississippi River with Wisconsin on the eastern side. The area abounds with wildlife and provided Joe and his siblings with plenty of opportunities to hunt, fish, and enjoy the outdoors. Joe’s dad, was a dentist in this rural community, and started Joe squirrel hunting at the age of 4, rabbit hunting at 5, and pushing deer on drives at the age of 8. It did not take Joe long to realize that wildlife and the outdoors would become his major direction and livelihood. After graduating from high school, Joe enrolled at a small catholic college in Dubuque, Iowa, later transferring to the University of Iowa. The University of Iowa was home to the oldest museum training program in the United States. One of the early classes Joe took at the University of Iowa was a course in anatomical modeling, but he quickly learned that the class in the adjacent room had students learning taxidermy and they were earning college credits as well. Joe recounted, “This looked much more interesting,” and he found out the elective hours in taxidermy class could be used towards his major. The next semester Joe approached the curator of the museum with his desire of wanting to take a taxidermy course. With two years remaining before graduation, he took all the classes available in the museum department while earning his degree in Zoology. In 1972 he started working on his masters degree and was asked to be a graduate student instructor in the Museum of Natural History. Joe went on to earned a masters degree in Science Education and was offered a full-time position as an instructor in the Natural History Museum at the University of Iowa in 1973. The Natural History Museum at the University of Iowa has a historic past. It began in the 1870’s and many noted museum taxidermists have studied in its science education program. Included in those numbers were William T. Hornaday, chief taxidermists at the US National Museum, the Head of the Denver Museum of Natural History, Alfred Marshall Bailey, and later Henry Wichers Inchmunk. During Joe’s employment at the University of Iowa, he had the opportunity to visit and learn from several curators at various museums in the United States. When he had questions, he had the opportunity to learn from some of America’s most accomplished taxidermists. When Joe was attending and working for the university, his main interests and duties were birds, both preparing study skins and mounting a few for displays. It was not until the mid 70’s that Joe’s interest in mammal taxidermy lead him in a direction that would one day bring him fame as the individual that brought detailed anatomy and finish work to competition taxidermy. By the early 80’s Joe’s museum experience at the university and strong passion to improve as a taxidermist fueled his desire to one day be the best. His goals were to mount animals with lifelike features, convincing attitudes, and incorporating his knowledge of habitat and dioramas. His knowledge of mold making and casting from his museum background proved invaluable for open mouth restoration and future eye developments. During his employment at the University of Iowa, Joe had already established a part-time taxidermy business, and with two young children at home, it made sense that Joe could care for the kids and do his taxidermy while his wife Peg continued her career at the University of Iowa. When Joe, Peg and the kids attended the 1983 and 1984 World Shows, it opened a big door for him, not only giving him incentive to be better, but seeing many successful full-time taxidermists. This reality offered reinforcement that taxidermy can be a fulfilling lifetime profession. There is another occurrence Joe said he saw and remembers vividly during the first World Taxidermy Championships in 1983. He had already been raising whitetail deer and studying them for several years before this show. He said, “I knew what a live whitetail looked like, but I just wasn’t quit sure how to get there. I saw 2 or 3 that I knew looked like live deer and later I saw they had the blue ribbons.” From that day forward, Joe knew he could one day be competitive at the World Show and produce taxidermy on a commercial level that reflected the natural look of live animals. He attended every seminar, talked to competitors, researched products and studied anatomy religiously in his deer pens. 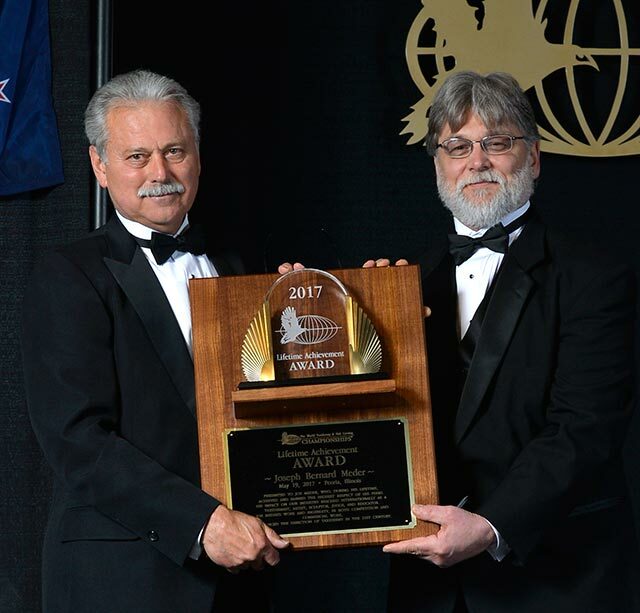 Another phase in Joe’s professional career was becoming actively involved in taxidermy associations, first as an officer in the Iowa Taxidermists Association, and a few years later, as a board member of the National Taxidermists Association. He was elected vice-president in 1991 and 1992, and President in 1993 and 1994. During this time he and Larry Blomquist were given the task of developing the NTA scoresheet for competition. These scoresheetc became the standard for state, regional and national competitions. The eye-opener that initially brought a high degree of awareness and attention to Joe Meder was when he captured Best in World Whitetail deer at the 1985 World Championships. His entry was a whitetail gasping buck that he had raised but died of natural causes. The gasping buck mount turned heads like never before. It graced the cover of Breakthrough Issue 9 in the fall of 1985. It was a deer in velvet with a deer fly on its nose. He had incorporated reconstructed lip lines, a textured nose, and eyes with white sclera, with very subtle blood veins in the eyes, as well as veining in the ears, techniques that had not used in whitetail competitions before. Joe was one of the very first taxidermists to introduce and establish the next level of detailed competition taxidermy. In 1986 he entered a deer in an aggressive pose titled “Ready and Willing to Defend’. This aggressive theme, along with impressive natural finishes, realistic attitudes of expression, and a creative habitat, captured not only the Joe Bruchac Award for Best Whitetail, but also the Best of Show Award, all at one of the NTA’s biggest shows ever, in Arlington, Texas. This piece marked the beginning of the popularization of pedestal mounts for deer mounts as we know them today. From that point forward, Joe became the most sought-after mammal instructor and judge in the United States. His studio, Kodiak LTD, became a magnet for trophy whitetail collectors and he would soon remount many of the previous world record whitetails, along with most of the named and well known antlers belonging to collectors during the 1980’s and 90’s period. His African safari clientel became another growing part of his business and resulted in many commissions for trophy room habitat displays. He and Peg hunted Africa on many occasions, bringing home not only trophies, but multitudes of reference, both photographic and death casts. His safari work exhibited the same flair of natural attitudes and detail finishing he had become known for in his North American mammal work. With Joe’s popularity flourishing, he was not only getting attention from hunters and collectors, but was constantly being approached by many within the taxidermy community asking for instructional workshops. Joe’s early experience as a teacher quickly became evident, and it was not long before Joe had a long waiting list for his one-week workshops, which he scheduled once every month. Many winners of state, regional, national and world champions credit Joe for their achievements in competition. It is very probable that no other individual is more responsible for helping others reach their potential as taxidermists as Joe Meder. Joe’s popularity and knowledge of mammal taxidermy reached much farther than North America, as Joe has been a judge and instructor at 7 European Championships and the two World Shows produced in Europe, as well as national competitions in New Zealand and Russia. Joe has served at a whitetail judge at 14 World Taxidermy Championships. Joe’s early study of anatomy at the University of Iowa paid dividends during his taxidermy career. Tohickon Glass Eyes quickly reached out to Joe for help in developing the Joe Meder Whitetail Eye. Soon after, his unique perspectives of whitetail deer anatomy and attitudes lead to one of the most successful lines of whitetail forms to enter the market when he started sculpting for Tom Powell Taxidermy Supply. His sculptures along with accurate nose and mouth castings, are as popular today as when they were developed almost 20 years ago. Joe’s accomplishments and influence in the taxidermy profession and its industry cannot be emphasized totally in such a short program. His impact has been far reaching, and he credits all of his success and accomplishments to God, with the loving support and encouragement from his wife Peg and childern Zach and Lindsey. Peg and Joe are soul mates, and Joe will be the first to tell you that all of his success was only accomplished because Peg was always there supporting him. 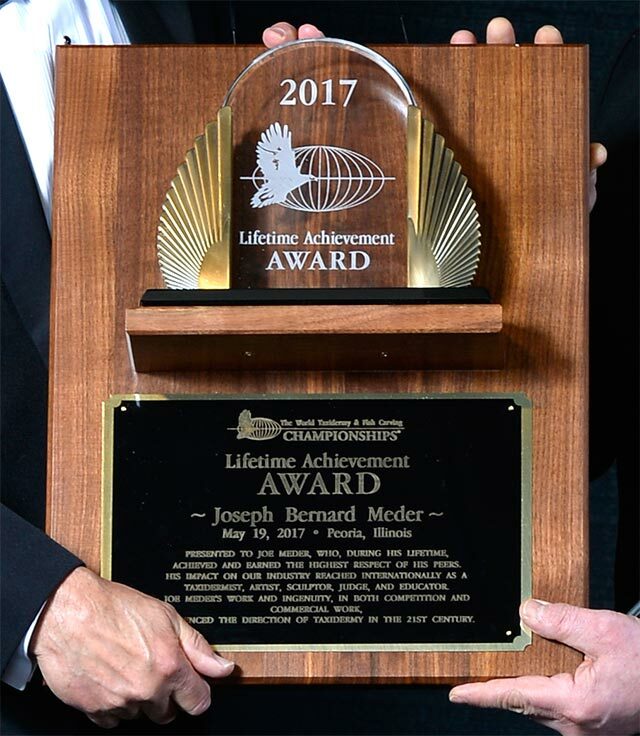 It is our pleasure and honor to award the fifth Lifetime Achievement Award to Joseph Bernard Meder.